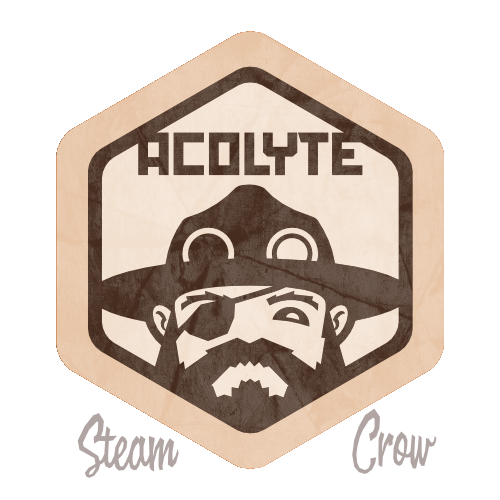 The Acolyte is a virtual badge, handed out in the form of a small card. You might get one when you order from SteamCrow.com, or you might get one from Daniel, Dawna or even another Ranger. However you get one, please do not share the code; don’t diminish the experience. This is a virtual badge only, but still conveys Glory. There is just one level of the Acolyte Badge. Since we’ll be handing out thousands of these things (2500 were initially produced), a virtual badge made the most sense. The icon of Baron Davis, peaking into a porthole, symbolizes helping newcomers IMAGINE8 the world around them.